Cooking is a melding of science, magic and camouflage, in which we challenge ourselves to modify the properties of the ingredients we use into a whole that transcends each element. Siamese culinary wisdom strives to create new gastronomic experiences by transforming the obvious and the well-known into new arcane and concealed pleasures. 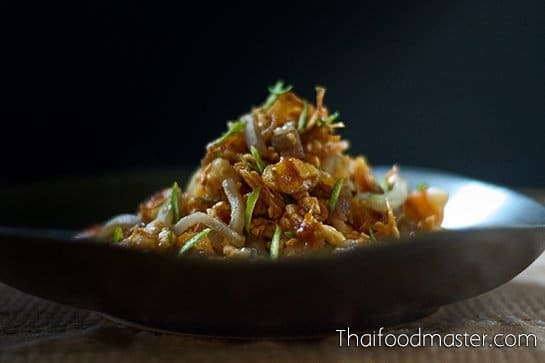 Thus, it is unsurprising that this dish, poetically known in Thai as goong saawn glin (กุ้งซ่อนกลิ่น), translates literally into English as “shrimp with concealed aroma”. 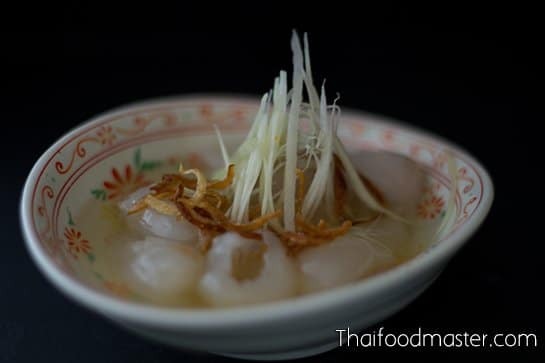 Shrimp meat is cold cooked with mild acidic elements, it is kneaded with lime juice and a bit of salt until the meat turns opaque-white and firm. The vigorous kneading ensures that all the proteins coagulate and reach the isoelectric point – at which the electrical charges of the proteins balance completely, losing their ability to retain liquids. 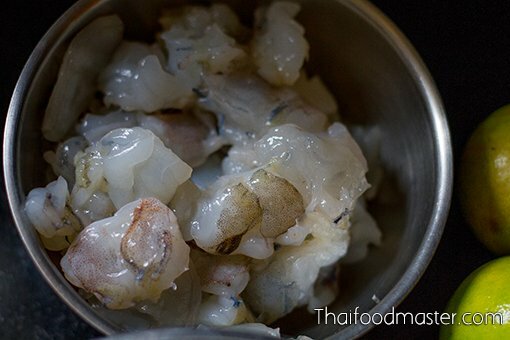 The coagulated shrimp meat is pressed well, and the liquids, called naam sa uh (น้ำสะเออะ), are collected. 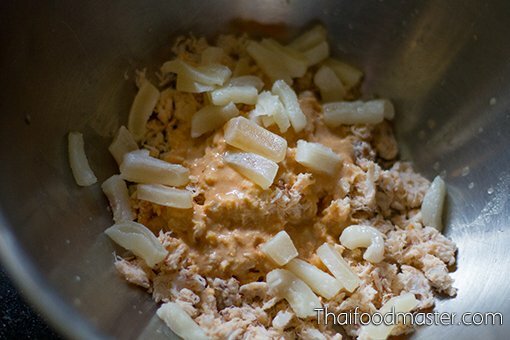 The shrimp meat is then further crumbled, by hand, to achieve a flaky, paper-like texture. A dressing is composed from the collected flavor-charged shrimp liquids by reducing them, on low heat, with shrimp tomalley which has been fried with a bit of oil and seasoned with sugar. This gives the dressing a saffron tint and a golden sheen, enriching and smoothing its texture, and empowering its umami savory flavor profile core. 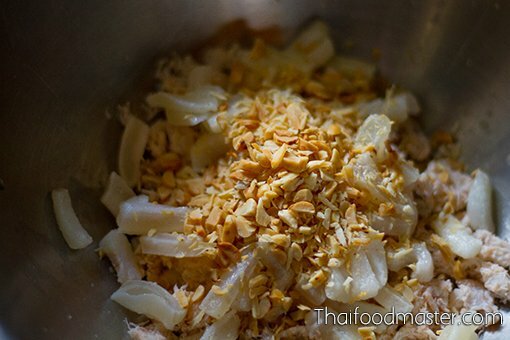 It is seasoned to a sour-salty-sweet flavor using lime juice, bitter orange juice (ส้มซ่า som saa), along with salt and sugar. 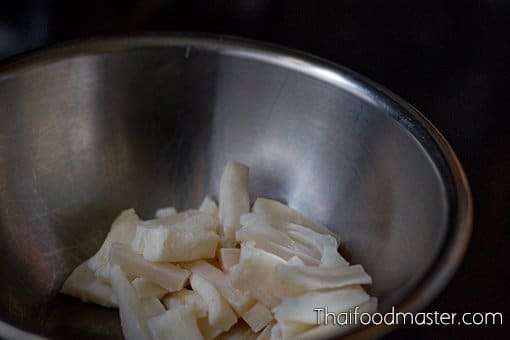 Separately, firm pork fat is also cold cooked, and kneaded with lime juice and some salt before it is blanched in boiling water until it is springy to the bite. 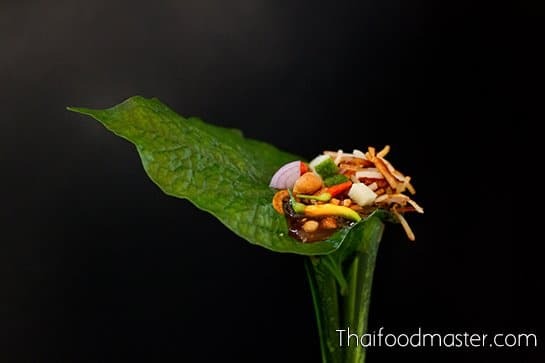 It is served in wrapped squares, using iceberg lettuce and young thaawng laang leaves (Erythrina orientalis, ใบทองหลางอ่อน); it can also serve as a topping for Thai deep-fried crispy rice cakes (khaao dtang thaawt, ข้าวตังทอด) or deep-fried crackers (khaao griiap, ข้าวเกรียบ). South American ceviche and the Filipino kilawin are examples of well-known dishes that utilize the technique of cold cooking proteins with mild acid. In Siam, a cold-cooked pork dish, muu naaem (หมูแนม), was once very popular. The earliest mention of muu naaem dates from the late 18th century – the beginning of the Rattanakosin Kingdom, with the establishment of Bangkok as the capital city. King Rama II mentions muu naaem in his boat poem. The verses of ‘Gaap Heh Chohm Khreuuang Khaao Waan (กาพย์เห่ชมเครื่องคาว – หวาน)’ were chanted during processions of the royal barge: this poem includes expressive listings of the King’s favorite dishes, offering us a limited glimpse into the Royal cuisine of that era. Queen Sri Suriyendra of King Rama II, and the Queen Mother of King Mongkut Rama IV, was probably familiar with muu naaem from her youth as Princess Bunrot (เจ้าฟ้าบุญรอด) during the reign of King Rama I. The version of muu naaem offered by the Queen to King Rama II was most likely a recipe popular at the time among the Siamese aristocracy. 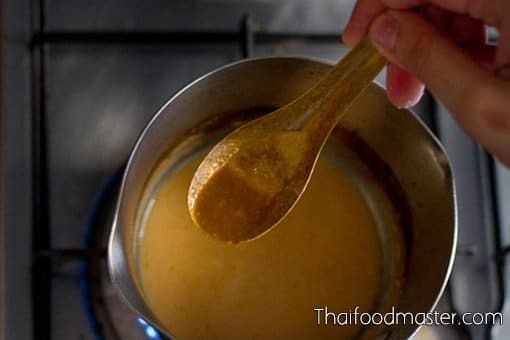 A muu naaem recipe passed unchanged through the generations – from the late 18th century until as recent as 1971 in the Sanitwong lineage – is that of Mom Yeam (หม่อมแย้ม). The fact that, in Siamese culinary literature, we can find almost identical recipes spanning over generations suggests that this recipe was, in fact, passed as a family tradition. Let’s follow the path of muu naaem through Siamese culinary literature! Mom Yeam was the daughter of Prince Vongsadhirajsanid (Prince Nuam) (พระเจ้าบรมวงศ์เธอ กรมหลวงวงศาธิราชสนิท), the 39th son of King Rama II and his 27th Queen Consort Prang Yai (เจ้าจอมมารดาปรางใหญ่), and a member of the Sanitwong lineage. Mom Yeam was well known in the food circles of those days, particularly regarding the preparation of food for the cremation ceremonies of the royalty, nobles and aristocracy. Her legendary skills earned her a mention in Lady Plean Passakornrawong’s 1908 epic cookbook, “Maae Khruaa Huaa Bpaa (ตำราแม่ครัวหัวป่าก์)”. (Note: Lady Plean was of Bunnag lineage). In 1935, M.R. Tuang Sanitwong (ม.ร.ว.เตื้อง สนิทวงศ์), the granddaughter of Mom Yeam and a matriarch of Siamese cuisine during the reign of Kings Rama V-VII, describes in her cookbook, “Sai Yaowapa (ตำรับสายเยาวภา)”, Mom Yeam’s recipe for muu naaem soht (หมูแนมสด). 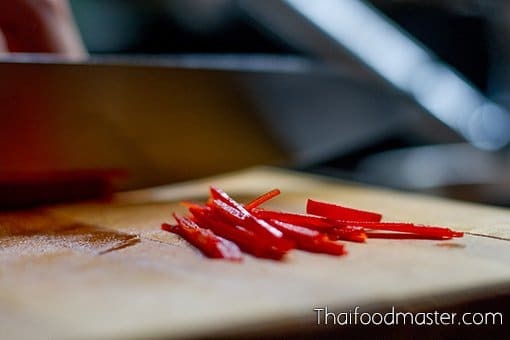 She also includes notes describing the use of other meats such as fish (bplaa naaem, ปลาแนม), chicken (gai naaem, ไก่แนม), shrimp (goong naaem, กุ้งแนม), and even salmon (bplaa saenmawn naaem, ปลาแซลมอนแนม). 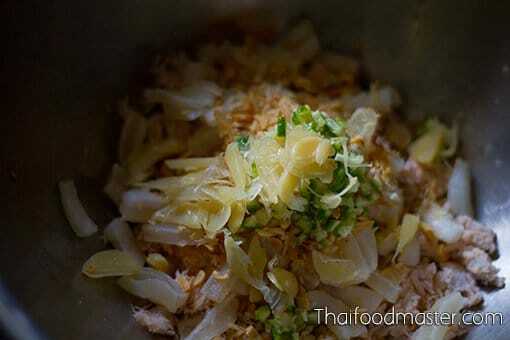 In addition, she includes a vegetarian version made with pink Indian lentils called thuaa naaem (ถั่วแนม). Other vegetarian varieties can be produced with roasted shredded coconut, or even cream crackers or bread toast. We then find an identical recipe for หมูแนม (กุ้งหรือเนื้อแนม) in Lady Gleep Mahithaawn’s book, “Recipes for Teaching Children and Grandchildren (หนังสือกับข้าวสอนลูกหลาน)”, printed for her 72nd birthday celebration on January 7, 1949. 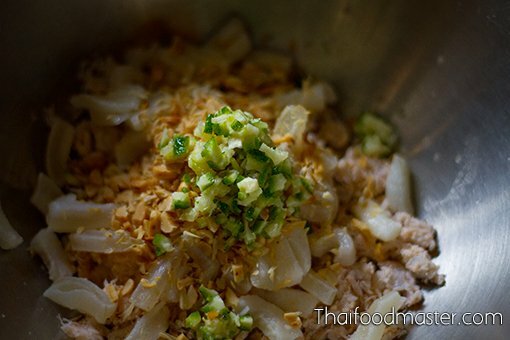 Last, we see this recipe for กุ้งซ่อนกลิ่น” หรือ “กุ้งแนม by Thanpuying (Lady) Plean Passakornrawong (ท่านผู้หญิงเปลี่ยน ภาสกรวงศ์), printed again in the 1971 edition of “Maae Khruaa Huaa Bpaa (แม่ครัวหัวป่าก์)”, a cookbook published in memoriam for Jao Jaawm Phit (เจ้าจอมพิศว์), Lady Plean’s daughter. 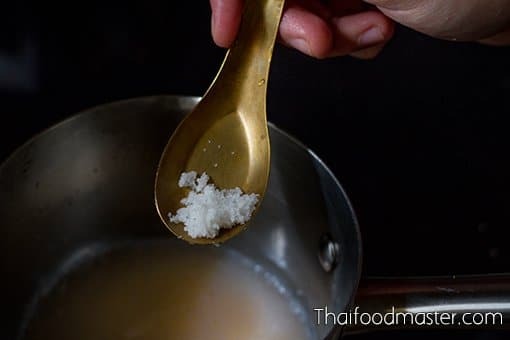 What follows is a step-by-step demonstration of goong naaem (goong saawn glin), according to the 1908 recipe in Lady Plean Passakornrawong’s “Maae Khruaa Huaa Bpaa (ตำราแม่ครัวหัวป่าก์)” cookbook. 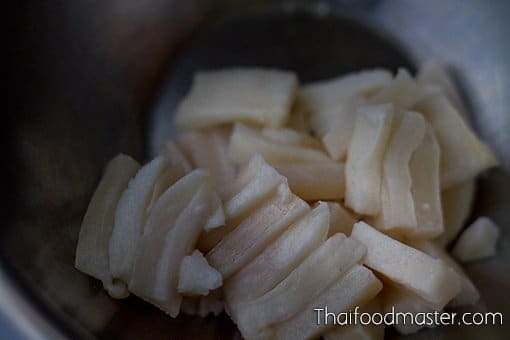 Goong naaem (goong saawn glin) according to the 1908 recipe in Lady Plean Passakornrawong’s “Maae Khruaa Huaa Bpaa (ตำราแม่ครัวหัวป่าก์)” cookbook. Flaky acid-cooked shrimp and the pork fat, along with thinly sliced roasted peanuts and very small unpeeled diced bitter orange (ส้มซ่า som saa), plus paper-thin slices of pickled garlic and julienned fresh red long chili peppers are mixed and seasoned with shrimp tomalley dressing. It is served in wrapped squares, using iceberg lettuce and young thaawng laang leaves. 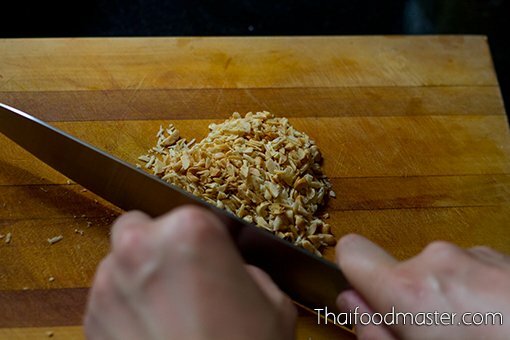 Using a sharp knife, thinly slice the roasted peanuts; set aside. Dice unpeeled bitter orange; set aside. 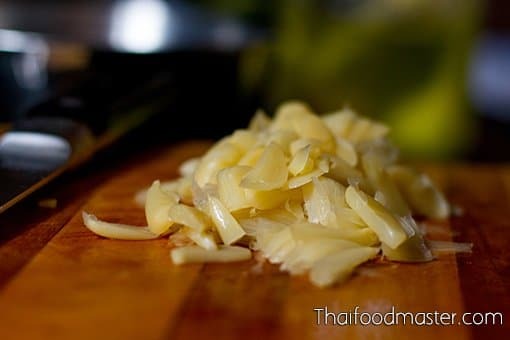 Thinly slice peeled pickled garlic; set aside. Julienne fresh red long chili peppers; set aside. 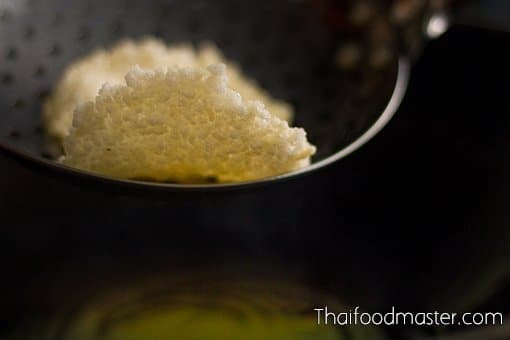 Deep-fry Thai crispy rice cakes; set aside. Peel the shrimp, and cut them into small pieces. Save the shrimp tomalley; set aside. 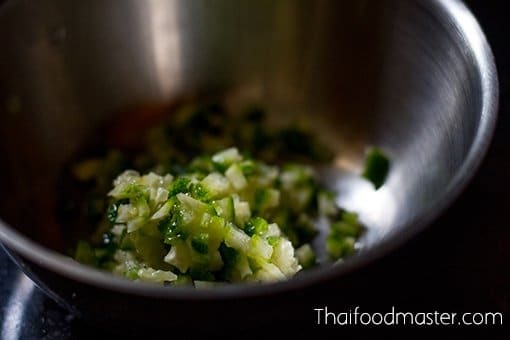 Squeeze lime onto the shrimp meat, and add a pinch of salt. 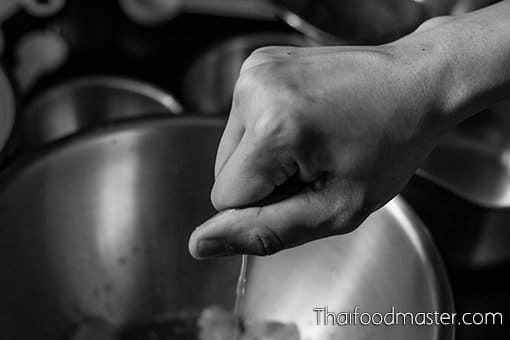 Using your hands, knead the shrimp meat vigorously until it is well cooked, and liquids begin oozing out the meat. 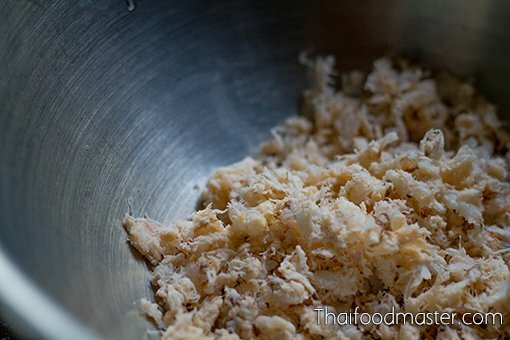 Using your hands, crumble the lime juice-cooked shrimp meat into thin flakes. 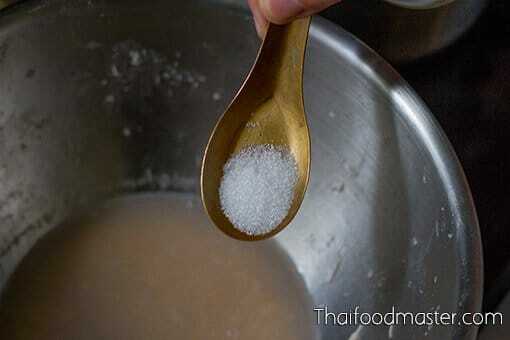 Season the remaining shrimp liquids with sugar. 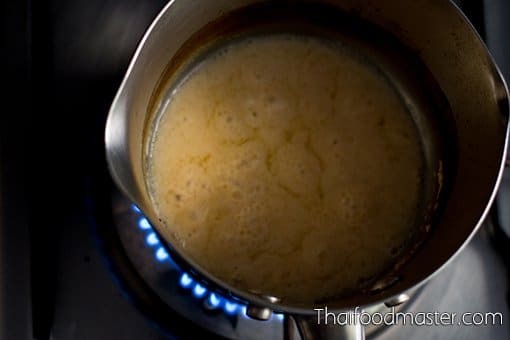 Place the liquids in a pot over low heat, and reduce until the mixture thickens slightly. Add the shrimp tomalley, and cook until the mixture achieves a thick consistency. Taste, and season with lime juice, bitter orange juice, sugar and salt to sour-salty and sweet; set aside. Cut the firm pork fat into thin strips. Knead the pork fat with lime juice and a pinch of salt. 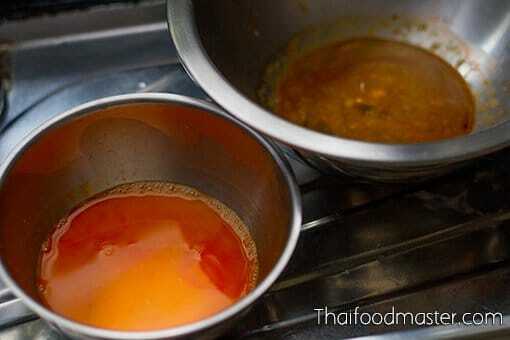 Blanch the fat in boiling water until it is fully cooked; set aside. 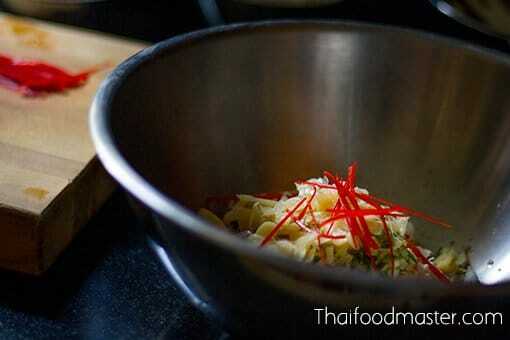 In a mixing bowl, combine the shrimp meat, pork fat and shrimp tomalley dressing. Add the diced bitter orange. Add the sliced pickled garlic. Add the julienned red long chili peppers, and toss-mix all the ingredients. Wrap the mixture in an iceberg lettuce leaf. 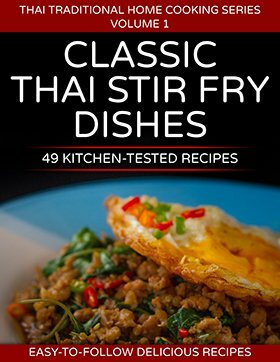 Serve with Thai deep-fried crispy rice cakes.